For patients requiring noncontinent urinary diversion with an intact but abnormally functioning bladder, ileovesicostomy is an alternative. Hsu et al. reported a laparoscopic ileovesicostomy performed for a 58-year-old woman with multiple sclerosis and a chronic indwelling catheter. A five-port transperitoneal approach was used. The ileal segment was extruded through an extended infraumbilical port site, harvested, and intestinal continuity was restored extracorporeally. After reintroducing the proximal end into the peritoneal cavity, pneumoperitoneum was re-established and the ileovesical anastomosis was performed from the spatulated ileum to a U-shaped vesicostomy using laparoscopic freehand suturing techniques. A loop stoma was created last, for a total four-hour operative time. Abrahams et al. reported a single case of pure laparoscopic ileovesicostomy in 2003 for a 46-year-old quadriplegic man with neurogenic bladder and recurrent urinary tract infections. Their four-port transperitoneal approach took 4.5 hours. The Endo-GIA stapler was used for ileal segment isolation and restoration of bowel continuity. Freehand suturing was employed for the ileovesical anastomosis; however, there was no bladder or ileal spatulation. 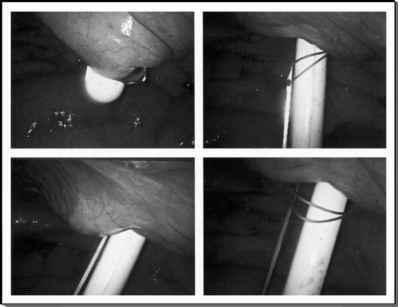 Abrahams and colleagues cite reduced mesenteric tension and bowel manipulation as some of the benefits of pure laparoscopic approach to ileovesicostomy. Creating the stoma first greatly facilitates intracorporeal suturing of the ureteroileal anastomosis by providing a point of fixation for the ileal segment. Most patients motivated and healthy enough to undergo an extensive or prolonged laparoscopic procedure will also be those desiring the long-term quality of life benefits of a continent urinary diversion as well as the short-term recovery benefits of a laparoscopic approach. Gill et al. published the initial two cases of completely intracorporeal laparoscopic radical cystectomy and orthotopic Studer pouch in a 42-year-old woman and 57-year-old man, respectively.